Working drawing showing mechanics and calculations and details of small parts for Paul Spooner's 'Five Artists Reflect On Their Waning Powers' (W49). Includes a list of 'things left to make'. Ink, fountain pen ink, blue pencil and graphite on thin paper. 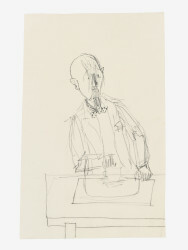 Working Drawing, 'Five Artists Reflect On Their Waning Powers', Paul Spooner, 1983, © Paul Spooner, Crafts Council Collection: AM444. Photo: Stokes Photo Ltd.